State Attorney General Maura Healey announced this morning she's supporting Ayanna Pressley for Congress in the Democratic primary in the 7th district, over incumbent Mike Capuano. In a message to supporters, Healey, who lives in Charlestown, explained why: Read more. A federal judge has upheld the state's long-standing ban on AR-15 rifles and similar weapons - and said the state had the right to extend that to "copycat" weapons that high slight differences from and different names than the weapons specifically mentioned in the original law. Read more. Attorney General Maura Healy this week urged state regulators to reject a deal between National Grid and the developer of the 61-story One Dalton project that would give the developer a price break on a required gas main and let it avoid the energy-efficiency charges regular customers who are not building luxury hotel/condo projects have to pay. Read more. Federal laws that let employers strip birth-control coverage from workers violate the First Amendment ban on government support of religion and are sexist and so violate the the Fifth Amendment right to equal protection, state Attorney General Maura Healey argues in a suit filed yesterday. Read more. A Brookline company that has figured out how to beam mobile-phone ads at people in very specific geographic locations today agreed not to use the technology to target people sitting in Massachusetts health facilities. Read more. The money is part of a $157-million national settlement with states over the way VW ginned up its diesel engines to show up as "clean" during emissions tests, the state Attorney General's office reports. Massachusetts Attorney General Maura Healey announced today she is asking a federal judge in Boston to let her joint the suit by two Iranian-born professors at UMass Dartmouth who were detained at Logan Airport because of that executive order. Read more. Attorney General Maura Healey announced a new hotline for reporting "bias-motivated threats, harassment, and violence ... following reports of harassment and intimidation of racial, ethnic and religious minorities, women, LGBTQ individuals and immigrants since Election Day." Call 800-994-3228, but the AG's office adds, call 911 first if you feel under immediate threat. 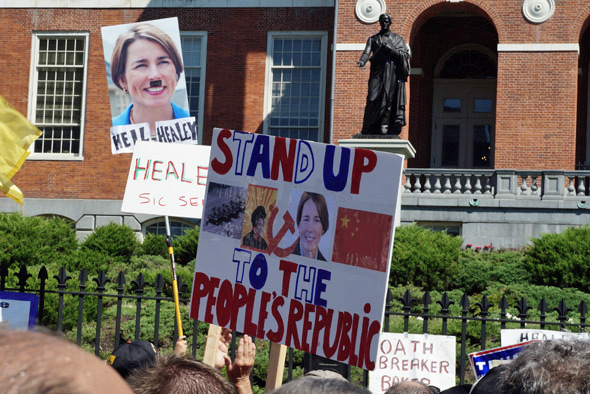 Is Healey a fascist or a communist? Probably both, protesters say. Hundreds of people converged on the State House today to protest Attorney General Maura Healey's decision to ban the sale of more types of semi-automatic rifles in Massachusetts and demand she rip her order up. Read more. Attorney General Maura Healey today announced an end to a loophole she said had let gun makers continue to sell high-powered weaponry in Massachusetts. Read more. Associated Press reports Attorney General Maura Healey and her counterpart in New York will sue VW over the way its diesel cars were designed to fake out emissions tests. A number of Massachusetts VW owners sued the car maker last fall over the issue. Attorney General Maura Healey announced a deal today in which the national IndyCar organization will reimburse fans who paid for tickets to the failed Boston Grand Prix race - and that her office is suing the local promoters to try to recoup those payments. Read more.